When in Rome, do as the Romans do. No better an adage describes surrendering yourself to the cultural surprises, culinary traditions and all, of a foreign country. This is especially true when you’re on holiday and wanting a little guilt-free indulgence. I have a feeling that this saying would have a slightly different meaning had it originated somewhere else, say Ghana for example, where roasted termites are occasionally on the menu. It probably would have been rewritten as When in Ghana, pretend you are full. But back to Rome. This ancient city, the centre of a civilisation dating back more than two-and-a-half millennia, is my favourite place in the world. Now the capital of Italy, it has everything I could ever ask for in a holiday experience. A vibrant culture. Fantastic food. Amazing wine. And an astounding history that has been preserved and showcased to all willing to simply walk around and occasionally look up. And let’s not forget the feeling that you’re in an Agatha Christie novel with your long flowy dress and obnoxiously large sun hat. Y’all know you’ve done it. Late last month, my family and I managed to sneak off to this ancient city for a long weekend. And as the saying goes, we enjoyed ourselves. Pasta for lunch, pizza for dinner, and gelato along the way. Just as I thought the trip couldn’t be more complete, I managed to spot these two beautiful bottles in a small Italian food store. Oh truffle oil. How you make me smile. This oil is fantastic on so many things. Sprinkle it on French fries, in stuffing, or even on parmesan popcorn, and your dish goes from basic to five-star instantaneously. 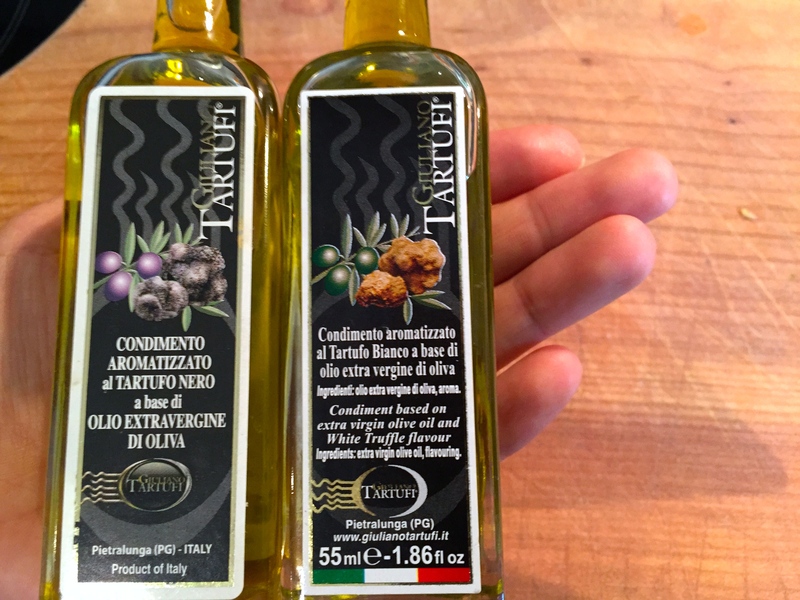 Thankfully, the truffle oils I bought were under 100ml, making it easy to throw into my liquid container at the airport (yay for no check-in baggage!). When we returned home, I immediately missed my pasta. But as we weren’t in Rome anymore, I could no longer enjoy the guilt-free indulgence that had carried me through the trip. Instead, I decided to find an alternative way to enjoy my Italian flavours. Italy. Meet healthy Italy. My new culinary creation — jam packed with flavour, without the guilt. 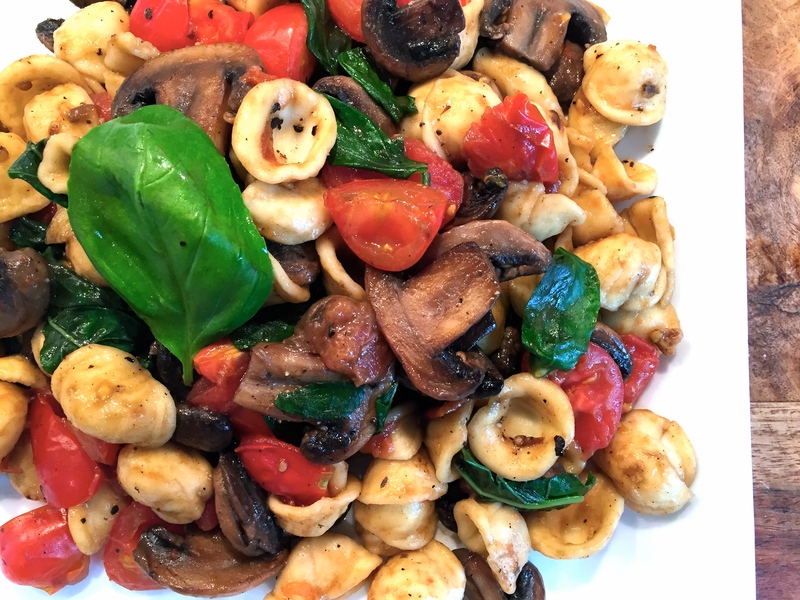 A simple mixture of sautéed mushrooms, cherry tomatoes, and fresh basil, tossed together with freshly cooked orecchiette and, you got it, a loving drizzle of truffle oil. I didn’t even use parmesan cheese. You probably could. But I was determined to keep it simple. The dish starts out with freshly sliced mushrooms, a good lot of them. Slice them thick, then toss them on a heated pan with a small spoonful of butter and a bit of salt. When the mushrooms begin to brown, add a bit of water (about 1/4 cup), then turn down low and simmer for 30 minutes, stirring the bottom of the pan every 10 minutes or so. The key to getting these mushrooms right is to give them time. Let all the water evaporate, and let them brown properly. If they begin to stick to the pan too much, don’t add more butter. Just splash another bit of water on the pan and give it a shake. While the mushrooms are browning, finely slice up one or two cloves of garlic, as well as about 350 grams of cherry tomatoes. Set aside. You can also heat a large pot of salted water for your pasta at this point. After the mushrooms have been sautéing for about 20 minutes, add the garlic, and continue to simmer. They say the most important thing about Italian cooking is the fresh ingredients. 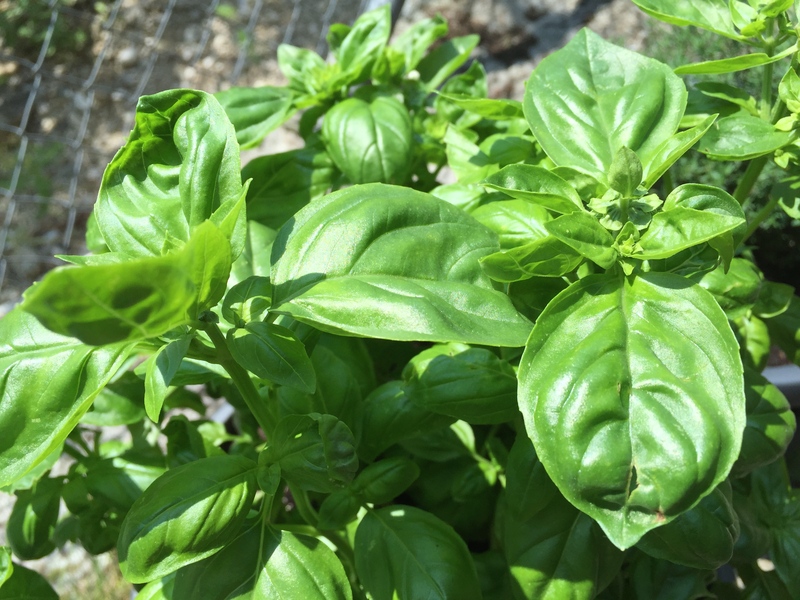 Luckily, my green-thumbed husband planted my favourite herbs this season, including a large pot of basil that grows like a weed on our patio. You need a lot of basil for this dish. Two large handfuls, washed and full. No need to chop. When the mushrooms have been sautéing for about 25 minutes, it’s go time. 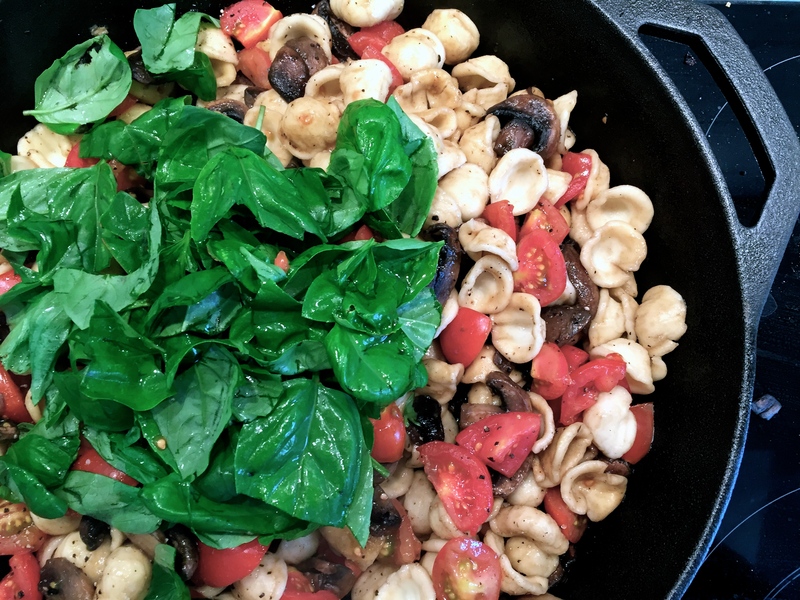 Add the orecchiette to the salted, boiling water and let cook for five minutes until al Dente. Before you drain, remove 1/4 cup of the water. You’ll use this later. Drain the pasta and set aside. Using a sprinkle of sherry if you have it, deglaze the mushroom pan, then add the chopped tomatoes, together with fresh pepper. Stir and let cook for a minute on medium heat, then add the pasta. Slowly add the water into the pan to loosen everything up, then give it another stir. You’re nearly finished. Drizzle with a good 1/2 teaspoon of truffle oil (to taste), then toss the basil straight in, give it 30 seconds to wilt slightly, and immediately serve. Is there such a thing as the truffle shuffle? I feel like there should be. I served this dish with a side of grilled chicken for my husband, whose Irish-born palette prevents him for eating a dish without some kind of meat. But this is a great dish on its own. Healthy, simple, and made, I hope, as the Romans would. 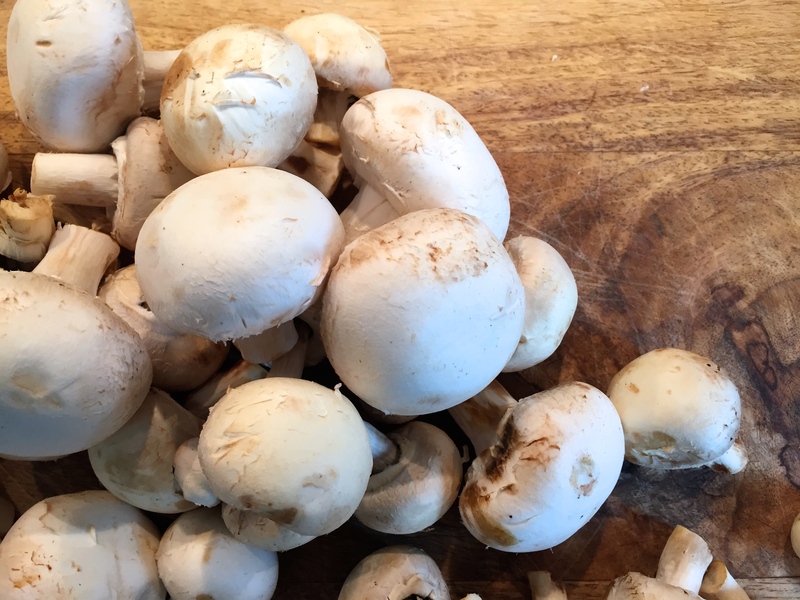 On a large pan on medium-high heat, add butter, mushrooms, and a 1/4 tsp salt. Mix well, then add a 1/4 cup of water, lower heat and simmer for around 30 minutes, stirring every 10 minutes. Cook pasta in salted, boiling water. Before draining, remove 1/4 cup water. Set aside. After mushrooms have been sautéing for 20 minutes, add garlic and cook for another 5 minutes. When mushrooms are well browned and all the liquid has evaporated (about 25-30 minutes), de-glase with a bit of sherry, then turn heat up to medium and add tomatoes and pasta. Stir well, slowly pour salted pasta water into the pan, then stir again. 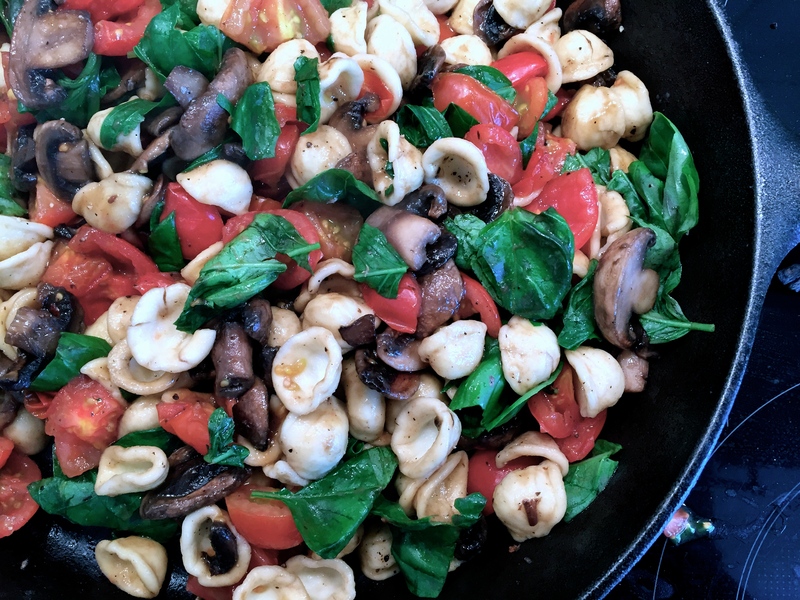 Drizzle with truffle oil to taste, then add basil, stir well for 30 seconds, and serve.